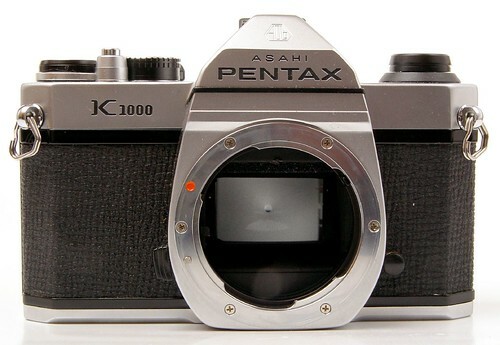 The Asahi Pentax K1000 was introduced in 1976 as an affordable camera for the amateur photographer. 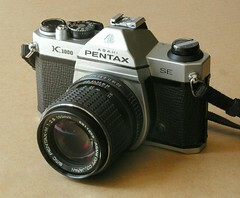 It survived much longer than originally intended and became the archetypal "students' camera." The K1000 is equipped with all features required for manual photography: it has a mechanically-timed focal-plane shutter with speeds from 1 to 1/1000 second, and a TTL match-needle metering system, but no automatic exposure modes. 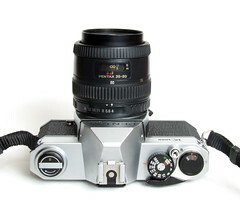 It can accept all the K-mount lenses made by Pentax and licensees such as Ricoh and Cosina. There is no depth of field preview button, self timer, or mirror lock up. 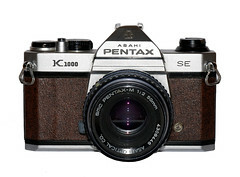 The K1000 SE is almost identical, the only difference being the addition of split-prism rangefinder and microprism ring focusing aids to the focusing screen. Initial versions also had a brownish coloured leatherette, while later SE's were the normal black. 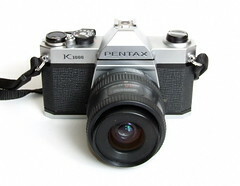 Despite its great popularity and longevity of the same basic design, Pentax finally ceased production of the K1000 after more than 20 years in 1997. This page was last edited on 21 November 2017, at 11:41.